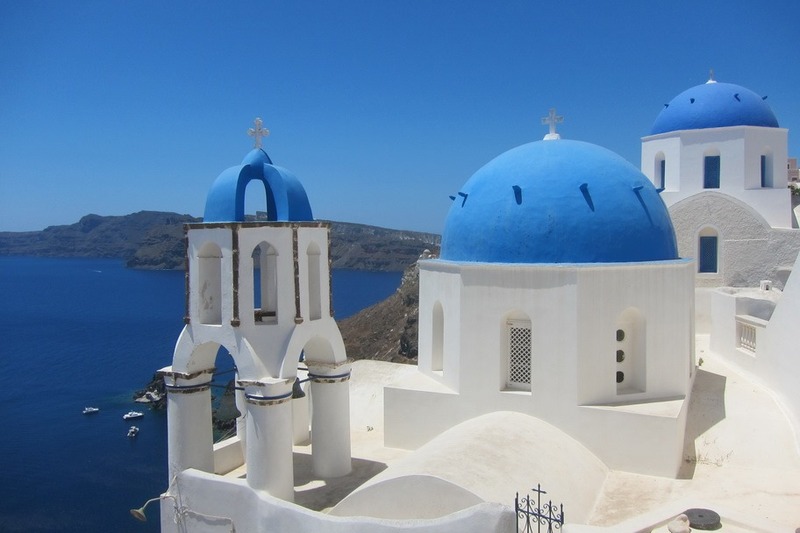 Visiting the Greek Islands was a dream for Mrs. Selfish and I, and they certainly are beautiful. This is not to say that the trip was perfect, however. 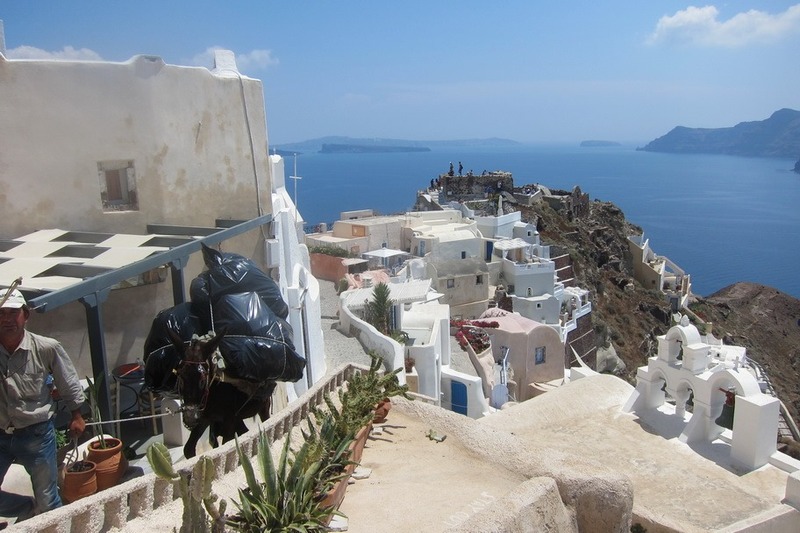 Our trips frequently aren’t, and we tend to gloss over some of the crappier parts of traveling: food poisoning, scams, mediocre foods, gross hotels, etc. I have often found, however, that our experiences are tinged by our expectations and for better or worse my expectations usually match the pictures I see online: a solitary monk visiting Angkor Wat in the morning omitting the tourist hordes just off camera, the perfectly framed cafe in Paris minus the next door McDonald’s, the Great Wall of China at sunset with the silhouetted screaming hawkers pushing their wares. Stunning… so what’s the catch? 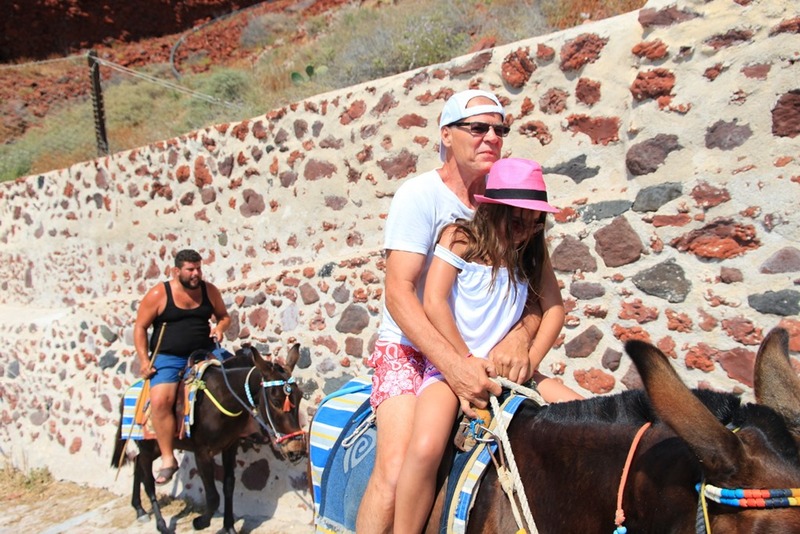 So here, in no particular order, are the many downsides of visiting Santorini and Mykonos. Hopefully they help you make your own informed decisions when traveling to these high profile hot spots. 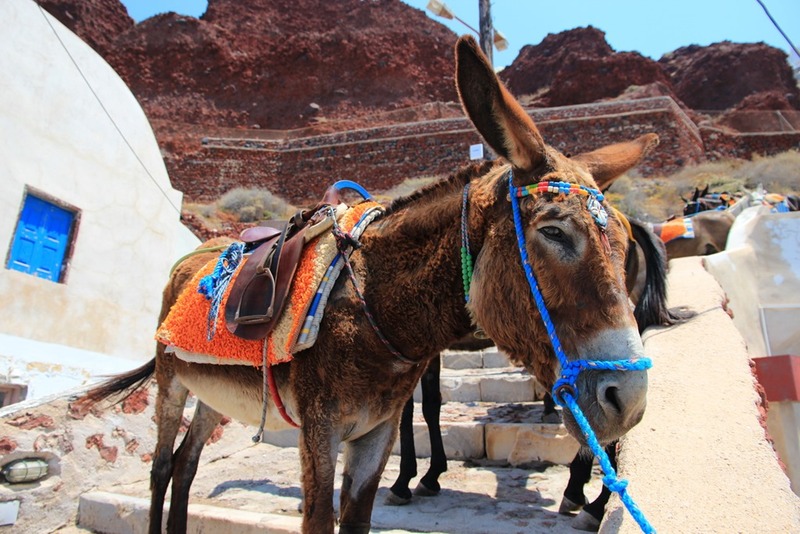 Donkeys are everywhere in Santorini. 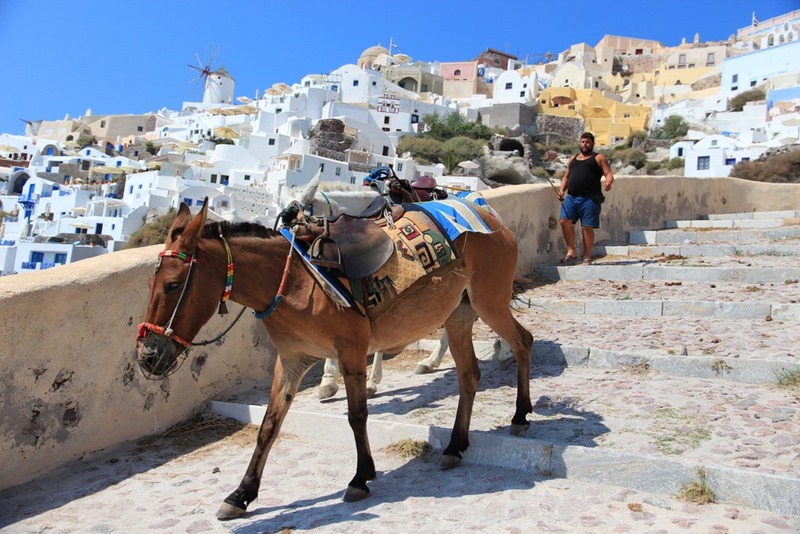 Thanks to Oia’s narrow streets, it’s nearly impossible for a car to maneuver, so donkeys are used to haul trash and tourists around. Mr. Selfish and I weren’t too overly impressed with Mykonos. We felt that the crowd was too young and drunk for our liking. Nevertheless, if we hadn’t spent two nights in Mykonos, we wouldn’t have taken a day trip to Delos, which was awesome. Delos is known as one of the most important mythological, historical and archaeological sites in Greece. According to mythology, it is the birthplace of the gods of Apollo and Artemis. 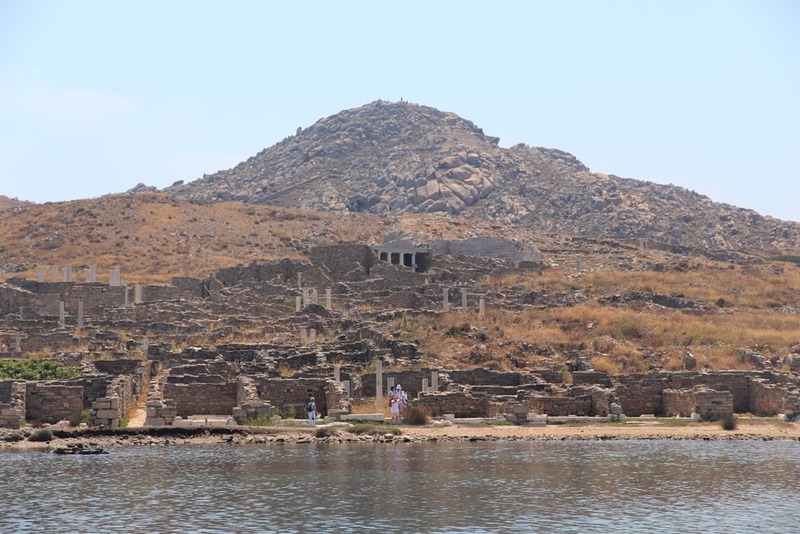 Although Delos is still being excavated, a great deal of excavation has already occurred. Mr. Selfish loves ruins and was in heaven. While researching the Greek islands, I discovered that Mykonos is known as a huge “party” island. Against our better judgment, particularly since we are not (and never have been) rambunctious party-goers, Mr. Selfish and I still decided to spend two days in Mykonos. It just looked so lovely in all of the photos I saw online. Well, we were not let down. Mykonos is indeed as pretty as the photos but also full of young, loud, and drunk party-goers as its reputation would have you believe. Mr. Selfish will go over the party side of Mykonos in a later post. 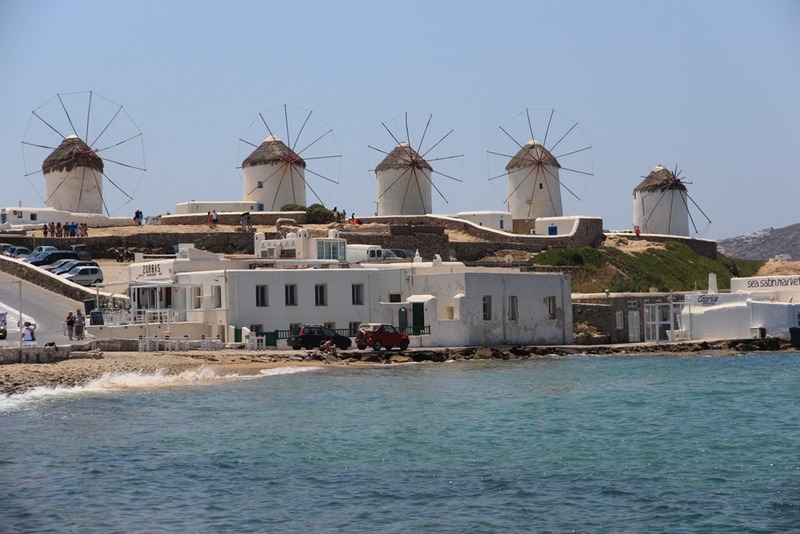 This post will focus on all things pretty in Mykonos.